Even with the financial crisis, Buffett’s advice to buy in the index fund has been effective over time. The famous and most successful investor of all-time Warren Buffett recommends buying a low-cost index fund spread out over time (dollar-cost averaging). Specifically, he recommends the Vanguard S&P500 Index Fund. Of course, there are multiple ways you can take on Buffett’s recommendation to invest in the index fund and we’ll talk about the most popular ones here with a look at pros and cons of each. Now, you can go over to vanguard.com and open up an account. You sign up for their S&P500 Index Fund – and generally choose between their Investor Share Class or their Admiral Share Class. The Vanguard Investor Share Class costs more (.17% instead of .05% expense ratio) – but allows you to get invested with a smaller amount ($3,000), rather than a $10,000 minimum requirement for the Admiral Share Class. If you have $10,000 or more to invest, then you can qualify for the Admiral Share Class lower expense ratio of .05%. What if you don’t have $10,000 but want that coveted .05% expense ratio? You can still get that! You get that through the Vanguard S&P500 ETF (relatively new compared to the other two, more traditional options. The VOO is a closed-end mutual fund that does pretty much exactly the same thing – track the S&P500. You can buy VOO with any brokerage (TD Ameritrade, Fidelity, Charles Schwab, Etrade, etc) — you are not restricted to Vanguard, whereas with the VFINX and VFIAX you need to have an account with Vanguard. The only difference is with VOO, you might have to to pay a brokerage trading commission (typically $7-$10 per trade) and that varies depending on the brokerage house. If you want to dollar-cost-average in the way Buffett advises, then each month or however often you decide to buy a fixed dollar amount of the index fund, will cost you a trade commission. Over time, this can add up. 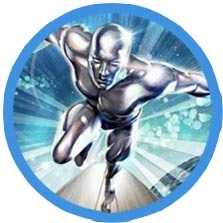 But even that trading commission fee can be avoided – I’ll show you how. But first, here’s a quick run down of each of the 3 major S&P500 offerings from Vanguard. Pros: You can buy VOO at any brokerage, not just Vanguard. Cons: If you were to dollar cost average over time, as Buffett suggests, each time you add to your investment, it’ll cost you one trade commission cost, which is typically $7-$10 per transaction, depending on your broker. Again, I’ll show you how to avoid this fee further below if you really hate fees. This trading commission cost does not happen when you invest directly with Vanguard in an index fund. Pro: Since VFINX is an index fund, you can auto-invest a certain amount over a period of time WITHOUT incurring trading commission costs. This is one of the main benefits of an index fund. If you have more than $10,000 to invest, the Admiral Share Class of Vanguard S&P500 Index Fund is where you want to be. This ensures you have the lowest expense ratio (.05%) – and you also avoid any potential trading commissions that are typically associated with buying the Vanguard ETF (VOO) or the traditional S&P500 ETF (SPY). Is it Possible to Avoid Trading Commissions on S&P500 ETFs (VOO and SPY)? Yes, if you want to dollar cost average into the S&P500 index, what you can do is open an account with a “no-commission-feee” broker like Robinhood. 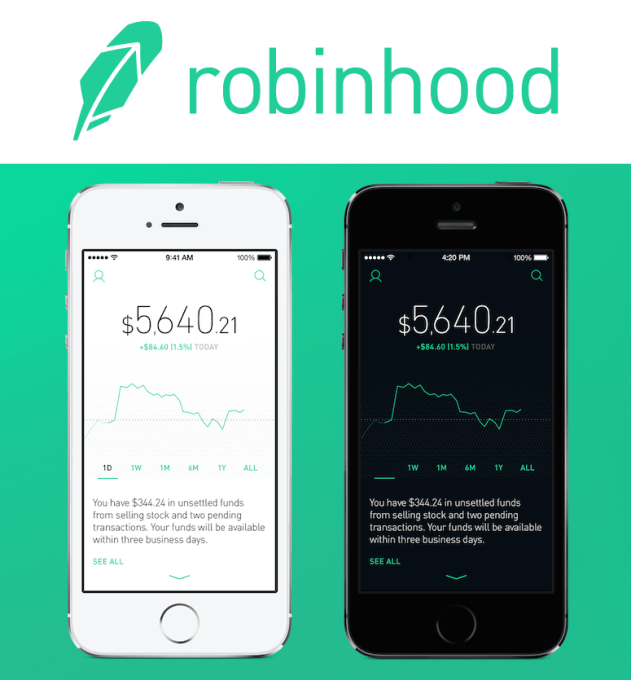 Of course, Robinhood makes money in other ways, such as charging monthly fees to access to margin, etc, but if you are strictly only interested in investing in the index fund and you want to dollar cost average your way over a period of time without paying a penny in trading commissions, you can do so with the Robinhood app. The VOO exchange-traded-fund (created by Vanguard). Either SPY or VOO are great. Over the long run, VOO actually slightly out-performs SPY, although this can vary depending on market conditions. But for the most part, their performance is virtually identical. You can use the Robinhood App to Follow Buffett’s Advice to Buy SPY or VOO – for FREE! I was able to download the app, link my bank account, transfer funds, and take a portion of funds that were available to trade to buy the SPY index fund — all in under 10 minutes. Go to Robinhood.com or download the Robinhood mobile app for iOS or the Robinhood mobile app for Android. Fund your account – you can do this really easily on the mobile app simply by linking your bank account by logging in with your bank credentials (I was able to link my Chase checking account with my Robinhood account, for example). After you transfer, some percentage (maybe 15% ?) will be eligible for trading immediately. The rest will be available after the funds settle in a few days. Start investing with whatever funds are available. Type into the search bar “SPY” or “VOO” – either one. Type in how many shares you want to order – you may need to calculate this. You’ll want to take the dollar amount ($) that you want to invest and divide it by the price of that ticker. Under “Quantity” type in “5” – for “SPY” ticker and click Buy. Since there are no commission fees, you don’t need to take that into consideration in your calculation. The Robinhood app looks nice – though is pretty bad for charting. Still, if you simply want to invest in SPY / VOO and don’t care for charting or anything else, then it gets the job done with some decent design interfaces. You’ve followed Buffett’s investment advice of buying the index fund! But there’s the second part of Buffett’s advice – which is to dollar-cost-average over time. This part is a bit trickier when you purchase SPY or VOO with your brokerage of choice. Buffett recommends dollar-cost averaging into an index fund over time, rather than buying everything all at once. While the above steps with the Robinhood app, do you let you get exposure to the S&P500 index for free, you will still have the same issue that you will have with any brokerage outside of Vanguard — and that is how perfectly you dollar-cost-average. With an Admiral or Investor Share Class of the Vanguard S&P500 Fund, you can dollar-cost-average more effectively than if you were to purchase SPY or VOO on your own via Robinhood or any other broker such as Interactive Brokers, Etrade, Fidelity, TD-Ameritrade, etc. Because Vanguard has a gazillion shares — and they simply allocate you an amount. So they can allocate you 5.32434 shares, for example — whatever decimal amount to match the exact dollar amount that you want to invest each month, for example. However, when you buy SPY or VOO, you are not allowed to buy a decimal number of shares such as 5.32434. Instead, you can only buy 5 shares or 6 shares — not something in between. The tricky part here is that you can only operate in increments of the dollar size of an SPY share or a VOO share. At the time of this writing, each share is a little over $200. Before the Nov 2016 Presidential Election, I deposited $8,000 and bought the Index as well as other indices such as IWM (Rusell) and QQQ (Nasdaq) – without paying a penny for commission. That means if you want to invest $1,000 every month, then theoretically, you’ll want to buy 5 shares each month. You’re not allowed to buy a decimal number of shares. So you’ll have to decide to buy either 4 shares and 5 shares, which makes the dollar cost averaging strategy not so perfect. So this is a subjective call you’ll have to make. It matters less when you are investing larger amounts and the difference between 1 share is negligible. But if you really care about these tiny details, then I would say this is one of the cons of buying SPY or VOO versus investing directly with Vanguard. While the exact calculation of dollar cost averaging over a period of time is not perfect when you buy SPY or VOO, I still prefer to use my own brokerage of choice to invest in SPY or VOO — I personally do this with various brokers–including Robinhood. 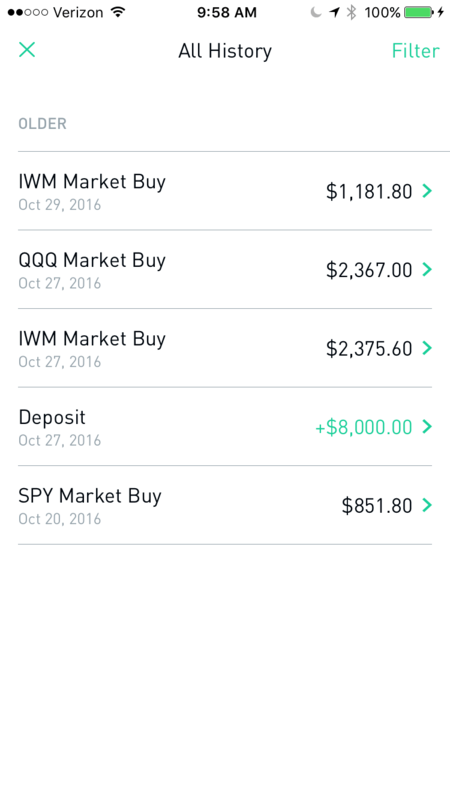 In fact, here is a screenshot of my Robinhood investment of $8,000 – that I entered (good timing) just before the Trump election victory at the end of October 2016 / beginning of November. In the spirit of Buffett’s advice, all you need to do is continue to invest small amounts into the S&P500 index fund – whether directly with Vanguard or on your own with SPY / VOO tickers –and do so periodically. Over time, the market forces will act, and if history and Buffett are any good, then your investments should go up over time.